An international contest for Digital Agencies - We are #GameOn For Bigger Challenges! You don’t win a prestigious competition every day. Such moments are rare and are to be cherished upon. If you were wondering who won which prestigious competition, give us the privilege to inform you that SRV Media Pvt. 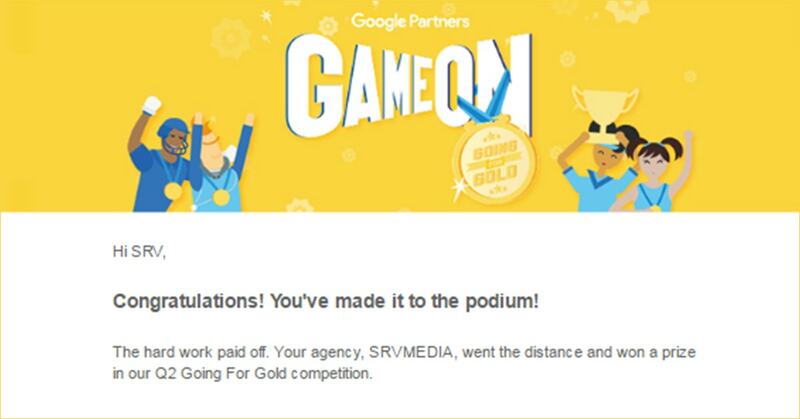 Ltd. have won the Google Partners #GameOn International Contest for Digital Agencies. We could lay our hands on this prestigious award by generating maximum results through Google Adwords, which in turnincreased the revenue for our clients over the last quarter. This moment of glory can all be attributed to our toil, dedication, and belief from our clients who’ve always given us a step of freedom which helped us achieve what we’ve always dreamed of. As a part of winning the #GameOn competition, two highly skilled individuals from SRV Media Pvt. Ltd. will fly to San Francisco, California to attend the ‘Google All-Stars Partner Summit’. During a time when reputation and recognition don’t come very easily, we’ve managed to get on top of the game with our adroit and adept individuals who have time and again pushed the boundaries of hard work. Since our inception in 2011, we have kept each and every one of our clients content who not only are from India but are from various parts of the globe. We have spread our branches in various domains, whilst we sharpened our skills in managing education, real estate, healthcare, and manufacturing clients. During this hour of exuberance, we’d like to express our gratitude to each and every client of ours who laid their trust and belief in our work. Henceforth, we promise to work harder to excel in the mammoth world of Digital Marketing. Company Name: SRV Media Pvt. Ltd.
Digital Marketing Manager at SRV Media. Vishwajeet has more than 5 years of experience in SEO and Internet Marketing.